On 19 October 2017 a Service of Thanksgiving was held at St. Andrew’s to celebrate the life of Elspeth Mary Nairn, nee Gibbard. Elspeth lived at Glebe Cottage and for many years was a member of the Parochial Church Council, holding the post of Secretary. She was born on 18 January 1934 at her parents’ farm on the Strixton estate in Northamptonshire. 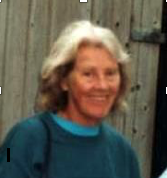 She died in the John Radcliffe Hospital on 7 October 2017. In 1971 Elspeth married Charles Roxburgh Nairn at Oxford. Charles died on 27 July 1995. Charles and Elspeth moved to Oddington and Elspeth soon took a full part in local life. She became a member of the Parochial Church Council and for many years, up to her death, was Secretary. She was a member of the Otmoor Womens Institute, holding the position of President and, in recent years, Treasurer. She was a guide at Waddesdon Manor, Blenheim Palace and Claydon House. I have such fond memories of Elspeth. She was so quietly efficient as PCC Secretary; agenda always out in good time and minutes succinctly and accurately recorded and never any fuss! I also have great memories of her reading lessons at Evensong which she always did in her unique style , always clearly delivered and with a sense of drama. Most of all though Felicity and I remember her as a very welcoming person not only to her home but also when we saw her at both Blenheim and Waddesdon. She always seemed so bright, positive and loving. I feel certain she will be enjoying the light and beauty of the life which is now hers. These are pictures of the floral tributes in the Church during the service.